We love trees. Do you? Prove it! Take a photo of you or a family member hugging a tree. We encourage you to get creative! 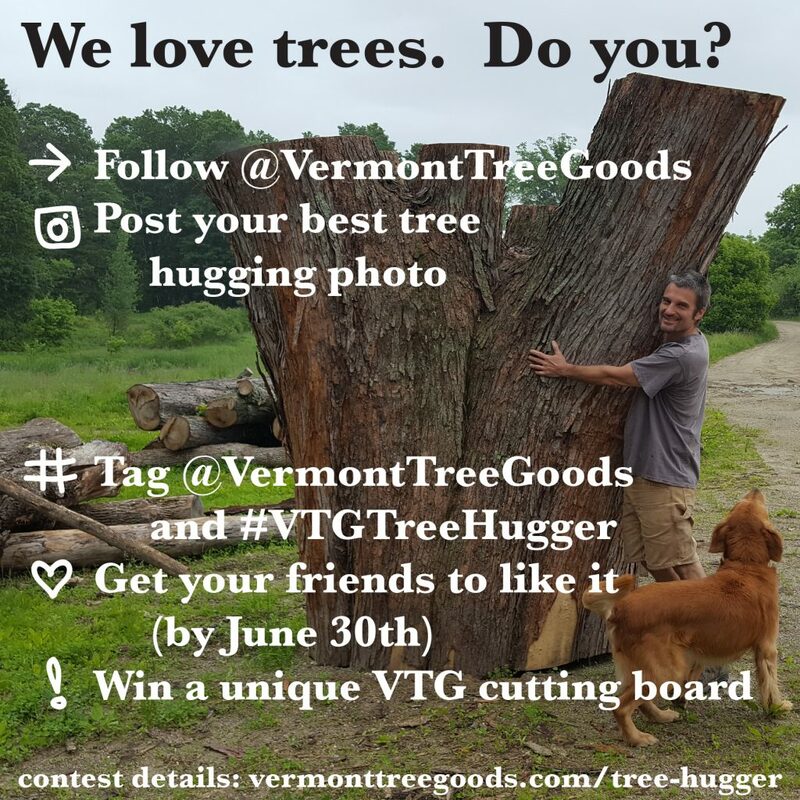 Then post the photo to Instagram and tag @VermontTreeGoods with the hashtag #VTGTreeHugger and follow @VermontTreeGoods on Instagram. Finally, spread the word! The number of likes the picture receives and the quality of the photograph will help our jury select the winner, so encourage your friends to like your post! We all know the weather in June can be a bit hit or miss. Start thinking about composing an amazing tree hugger photo now! Early submissions will likely accumulate more fan support, boosting your chances of winning. The Tree Hugger Contest runs from June 9th to June 30th at noon. The winner’s prize is a one-of-a-kind Vermont Tree Goods hardwood cutting board! Contact Details: This contest is being run by Vermont Tree Goods. Please contact info@vermonttreegoods.com or call (802) 453-4544 with any questions. Timeframe: This contest will begin on June 9th, 2017 and will end on June 30th, 2017 at 11:59am. Entrant Qualifications: Anyone with an Instagram account may enter. Each Instagram user may submit one photograph. The winning prize can be shipped to any mailing address within the United States. Winner Selection: A jury of Vermont Tree Goods staff will select a winner by considering the number of likes the picture has received and the quality of the photograph. Winner Announcement: The winner will be announced by Vermont Tree Goods on Instagram, Twitter, Facebook, and our website’s News section by July 1st, 2017. Vermont Tree Goods will also send a private message to the winner, requesting name and U.S. mailing address. Winner Response: If the winner fails to respond with a name and mailing address within 7 days, we will contact the runner-up and arrange to send the prize to them. Prize: Winner will receive a one-of-a-kind Vermont Tree Goods cutting board made in Vermont from Vermont-grown hardwood. The cutting board will be shipped to any address in the United States, as provided by the winner.